New Year’s Eve gift ideas to give when the clock strikes 12 and a Baby New Year arrives! Shortly after the clock strikes 12 and the last note of “Auld Lang Syne” plays, our thoughts turn to the new year ahead. Will this be the year that you finally switch jobs, go back to school, drop that nagging ten pounds, or take up a new hobby? What about friends and family with birthdays, anniversaries, weddings, and other celebrations in the works? Will they be looking for change or are they more likely to appreciate the comfort of sticking to what they know? 1. Hostess Gift. That rockin’ New Year’s Eve party didn’t plan itself. Find a photo of you and the hostess hanging out together. Upload it to make a personalized gift card and write the words, “Good Friend, Good Times” on the embossing line. Tie the New Year’s Eve gift card to a bottle of carpet cleaner, bubble bath, or dish soap—things she can use after the party is over. 2. Biggest Fan. Change can be challenging. If your friend or loved one is embarking on a move this year (literally or figuratively,) make a gift card to show your support. Take a picture of yourself cheering him or her on—pompons and all! Turn the image into a New Year’s Eve gift card and emboss “You can do it!” on the message line. Deliver the encouraging gift card with supplies needed for the adventure such as a journal (life change), snow scraper (climate change), or portfolio case (job change). If you don’t have a New Year’s Eve photo of your own, select a New Year’s Eve gift card design from our predesigned gallery. The gallery is full of gift cards created by our designers. 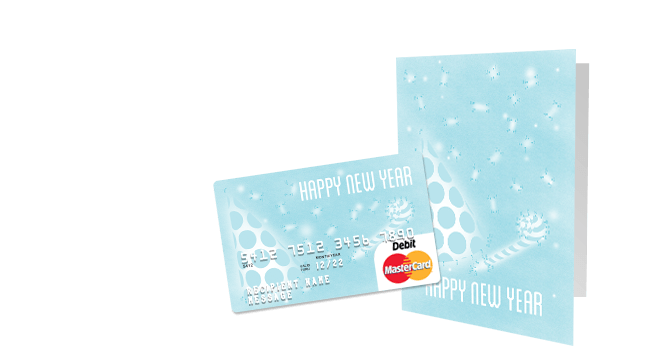 Use discount gift cards to save on New Year’s Eve decorations, dresses, and dinner! Start with party supplies at Michaels, drop by Cache to pick up a dress, then make reservations to join friends for a New Year’s Eve dinner at Outback Steakhouse. If you’re planning to have a quiet celebration at home instead, spruce up the house before the dinner party starts with home decorations from Bed Bath & Beyond or new tableware from Sur La Table. Yes, buying discount gift cards before you shop takes some planning. But saving money is a great way to start off the new year! 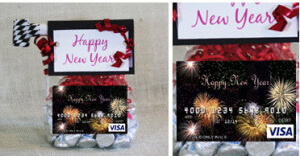 “Deliver a festive New Year's Eve gift card with party supplies to use when the clock strikes 12. For a longer lasting memory, deliver a personalized gift card with a clock or a calendar. Add a note that reads, "Looking forward to spending another year together." Great gift cards for party planning, getting dressed up, or going out to celebrate the new year.